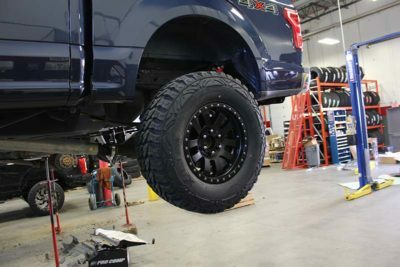 When beginning the exterior portion of our 2018 Ford F-150 project, we decided that there would be no better place to start than a suspension lift kit, larger tires, and more aggressive-looking wheels. 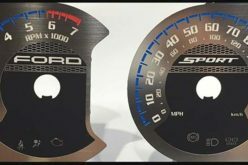 This immediately changes the entire look of the truck and can be easily done in no more than a day. 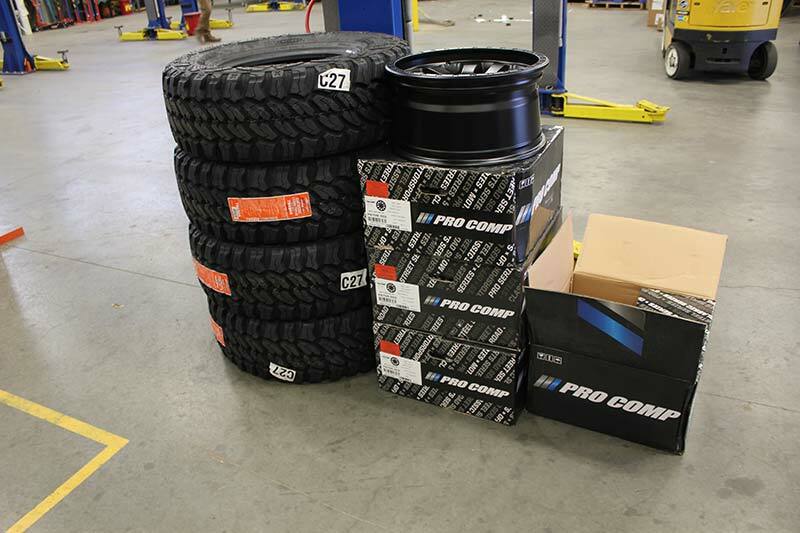 After reaching out to our friends at Pro Comp, they were generous enough to hook us up with a 4-in. lift kit, 18×9 Prodigy wheels, and LT305/70R18 Pro Comp Xtreme MT2 tires. Starting with the lift kit, we decided a 4-in. 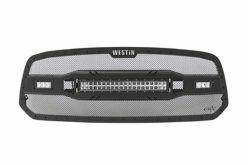 kit would work great as it isn’t quite as big as the popular 6-in. option which is just fine for us and it maintains more of the factory geometry for a smoother ride on-road. 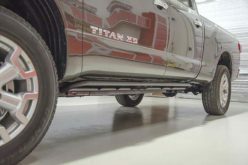 The kit easily clears room for larger wheel-and-tire combinations, provides more ground clearance, and immediately delivers a more rugged appearance for the truck, which is exactly what we were going for. 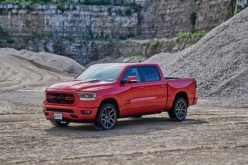 For the wheels, we originally debated on a few different options before finally choosing the Prodigy model, which will work great for our truck as they offer a more off-road-type look and do so without being over-the-top flashy. The black finish will also be a nice contrast to the nice blue exterior colour of the F-150. 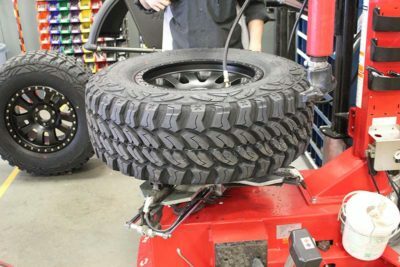 Pro Comp’s Xtreme MT2 tires have a reputation of being great both on- and off-road, while still providing the true mud-terrain tire look that we were after, so they were the perfect choice for this build. We ended up going with the LT305/70R18 size, which worked out great as they are only slightly smaller than the 35-in. 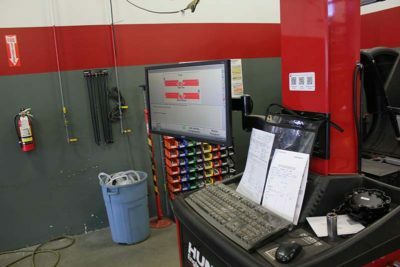 and allowed us not to worry about any possible rubbing once installed. 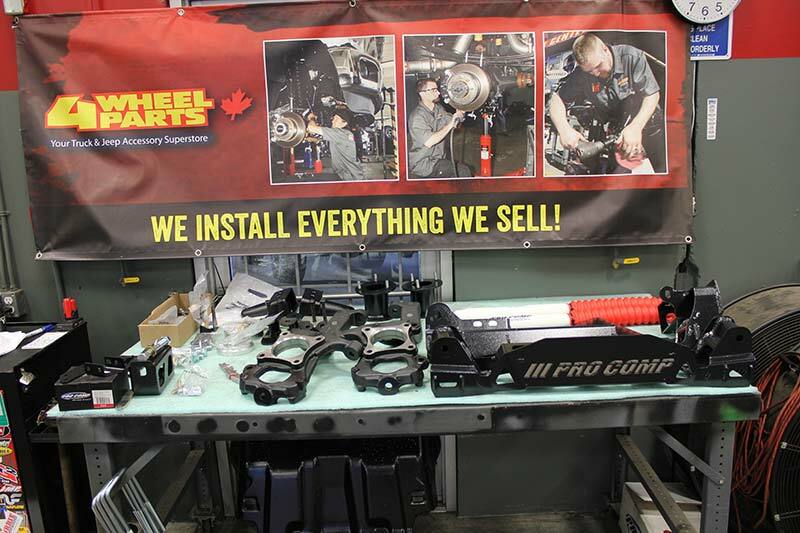 Once all of the products arrived from Pro Comp, we headed over to our local 4WheelParts store in Langley, B.C. where Adam and his team provided us with a seamless installation. 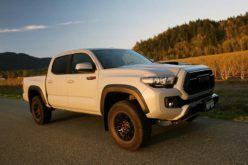 Once finished, the difference in appearance from the stock setup was huge and immediately turned the truck into an off-road capable machine. 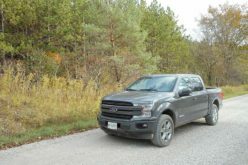 The truck rides just as well as it did on the stock suspension, and other than a slight loss in our full-turn radius, we were very impressed with how much the appearance of the truck changed without really altering the drivability. Huge thanks again to the folks down at Pro Comp and to all the guys at the Langley 4Wheel Parts Store for helping us complete the first phase of our build. Our 4-in. Pro Comp Lift Kit all laid out and ready to go including the pair of rear ES9000 shocks that are meant to provide a good ride both on and off-road. 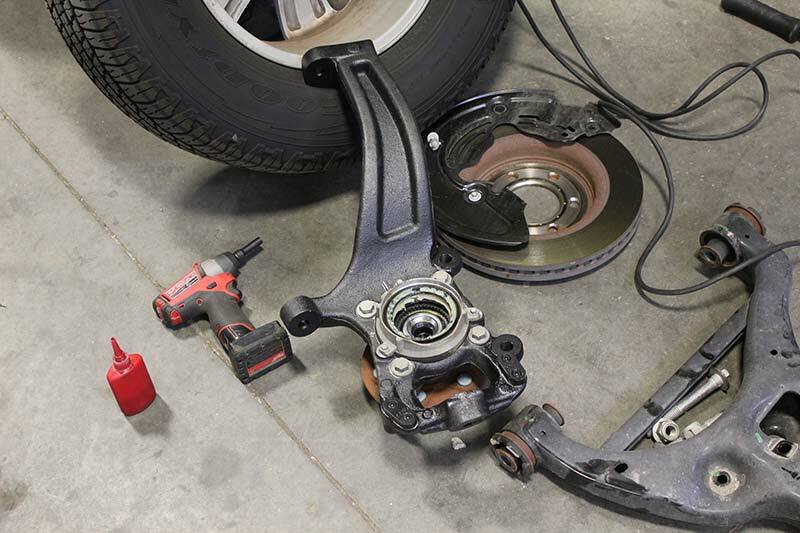 The kit comes with all necessary hardware and components and utilizes some of the OEM components to retain near-stock suspension geometry. 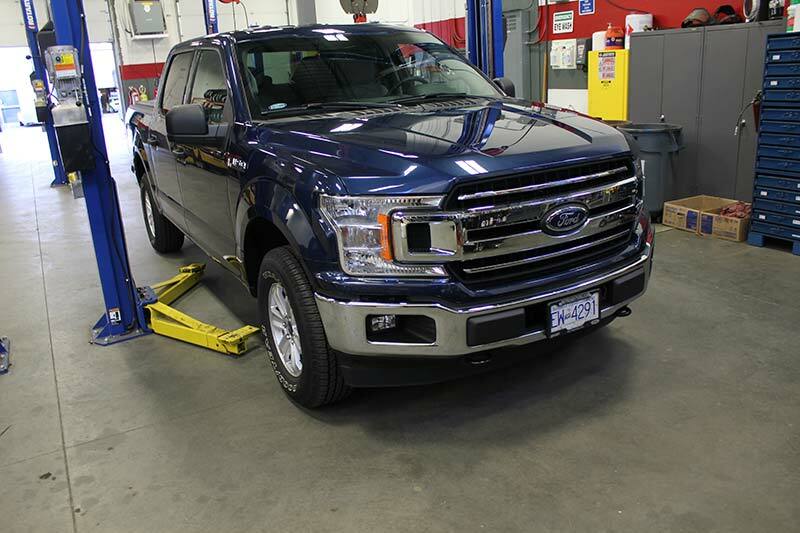 Our stock 2018 F-150 goes up on the lift, prepared to first have its wheels and tires removed and then its stock suspension system disassembled and removed. Before you begin, remove all skid plates. 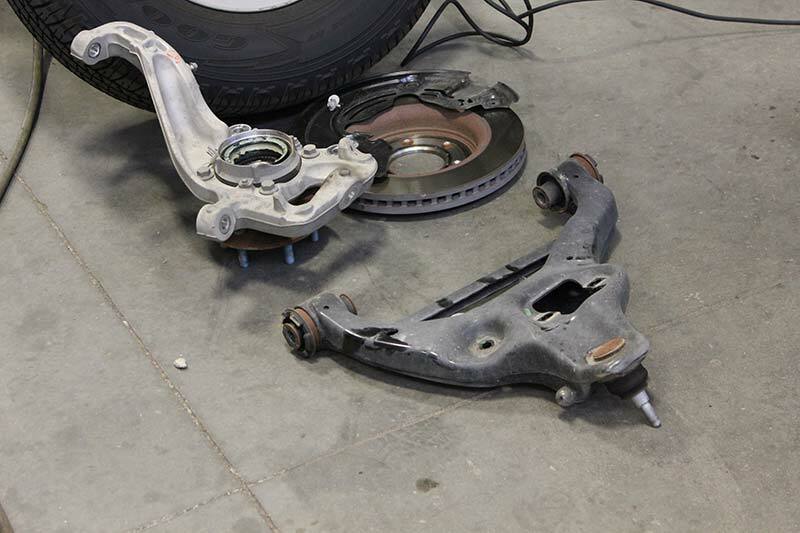 With the wheels and tires removed, the entire brake assembly is removed. 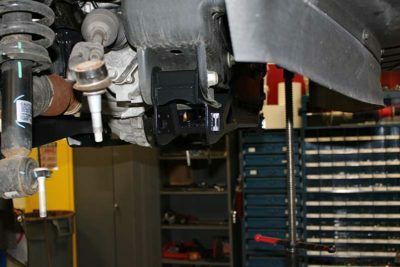 The upper and lower control arms, sway bar and steering linkage are then disconnected and set aside to be used again later. 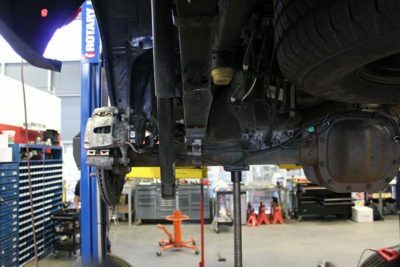 The factory strut and steering knuckle are then removed. We will be using our factory strut with the new setup but will be installing new heavy-duty steering knuckles. This process is repeated on the other side of the truck. 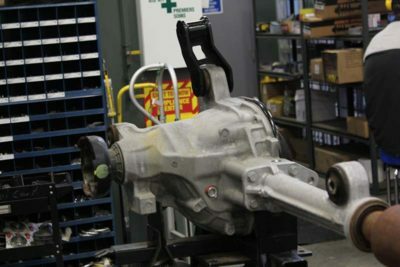 The driveshaft orientation is marked and it is disconnected from the differential. 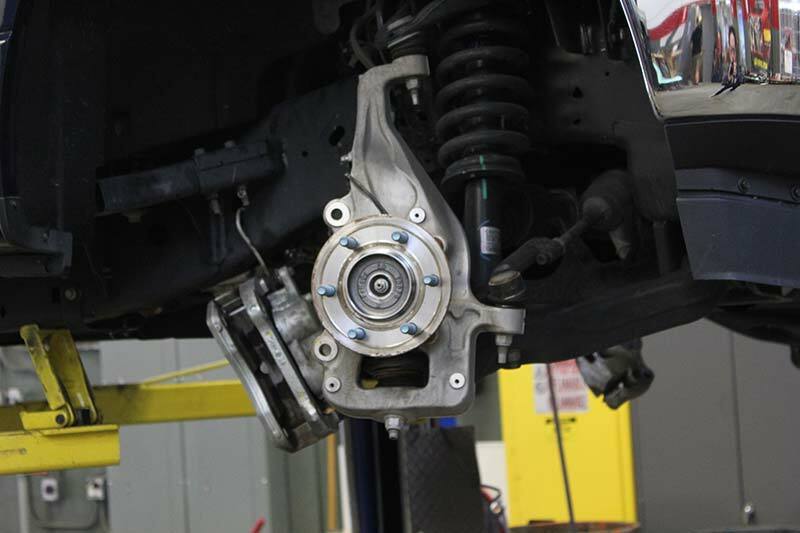 After the stock rear crossmember is removed, the differential is then removed carefully and set aside for later. In order to install the new rear crossmember, the driver’s side control arm mounting pocket part of the frame needs to be removed. 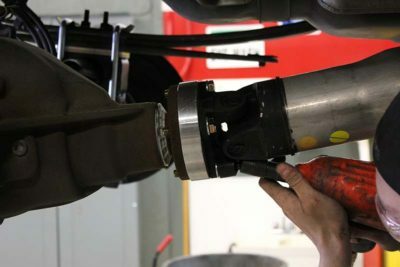 A cut mark is measured from the top of the cam bolt hole and then the pocket is cut away flush with the sway bar mount. 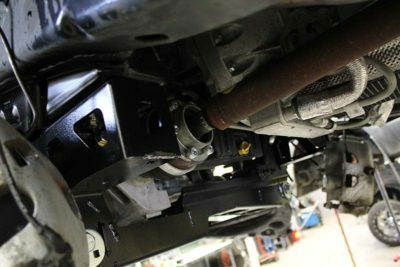 The Differential drop brackets are installed on both sides. 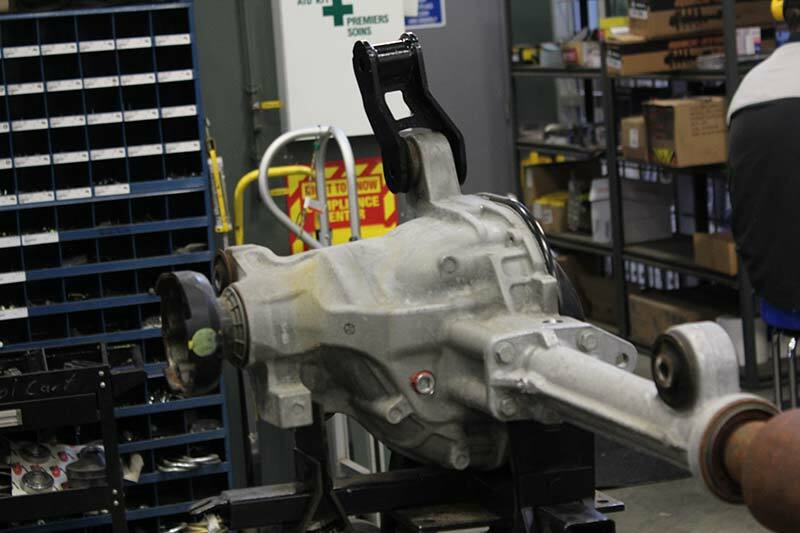 With the drop brackets put on, the differential is loosely installed back into place. 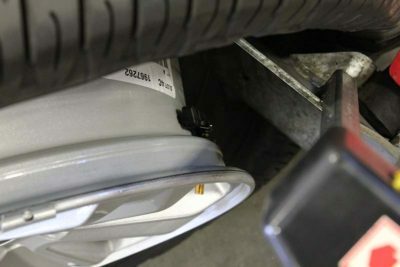 A differential hose extension is also installed to make up for the added distance. With the differential installed loosely, the front and rear crossmembers are put in. 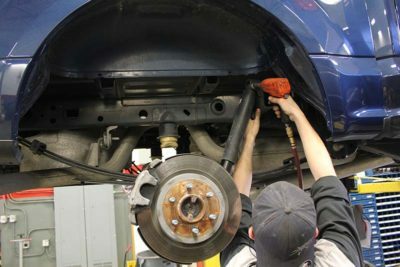 To check the fitment of the crossmembers, the lower control arm is mock installed to ensure that everything is where it is supposed to be. 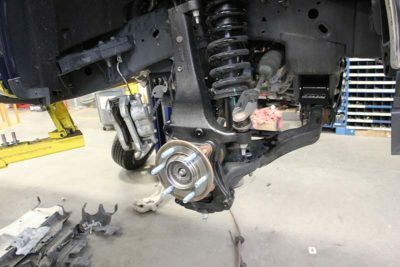 Next, the rear crossmember brace bracket is installed. 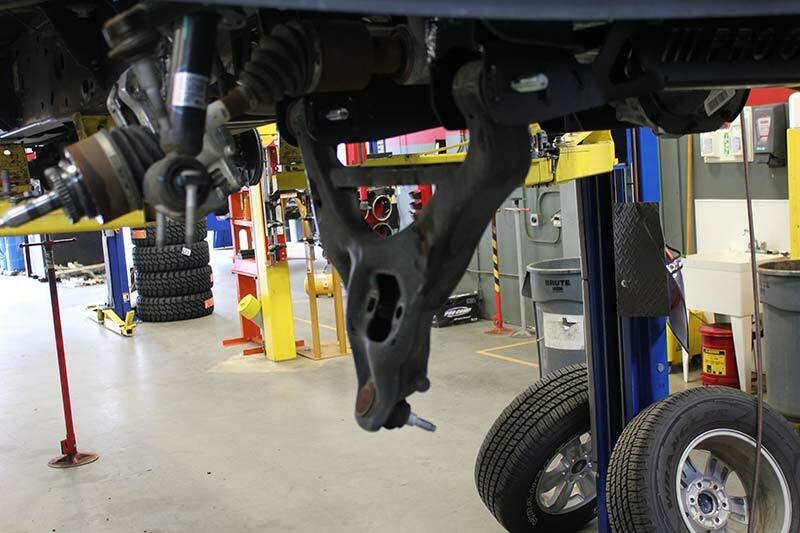 It is first lined up to the crossmember from the driver’s side near the part of the frame that was cut off. The mounting locations are first marked, then punched and drilled out with a ½-in. bit. 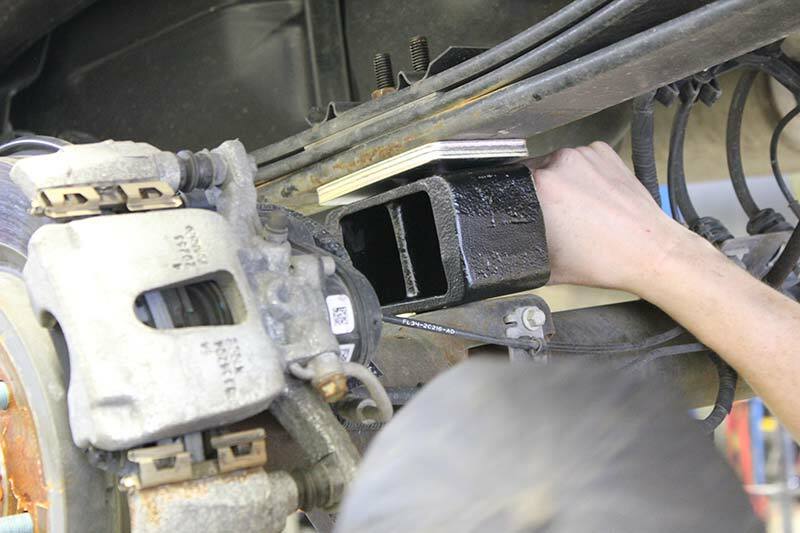 Bolts are then inserted into the new holes and tightened. 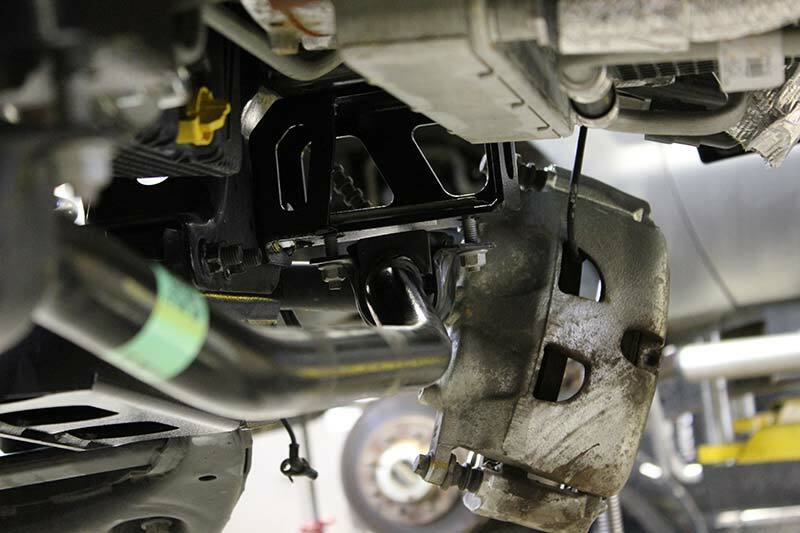 The lower control arms are then fully installed onto the new crossmembers. 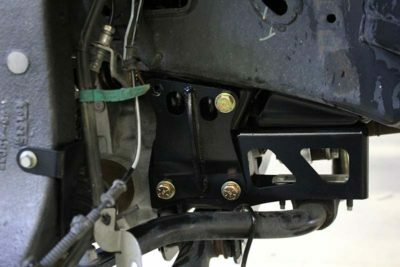 The skid plate is then installed to protect the differential and all crossmember and differential hardware is tightened and torqued to the manufacturer’s specifications. 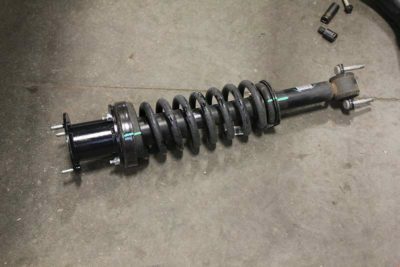 The factory front driveshaft is then reinstalled to the differential with a new aluminum spacer to correct the difference in the length. The factory sway bar is then reinstalled using the sway bar drop brackets. 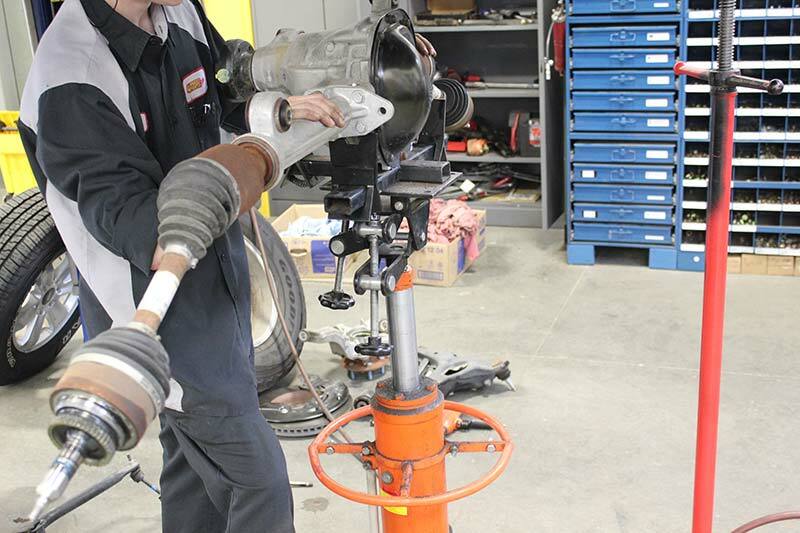 All the components from the factory steering knuckles are then transferred to the new heavy duty ones. Once the coil spacer is attached to the top of the factory strut assembly, we are ready to begin complete reassembly. 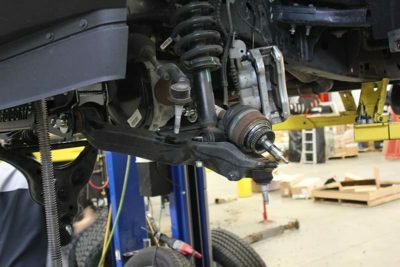 The new steering knuckle is installed and everything including the strut assembly are reconnected. From there our brakes get put back on with a new brake line relocation bracket to make up for the added distance. 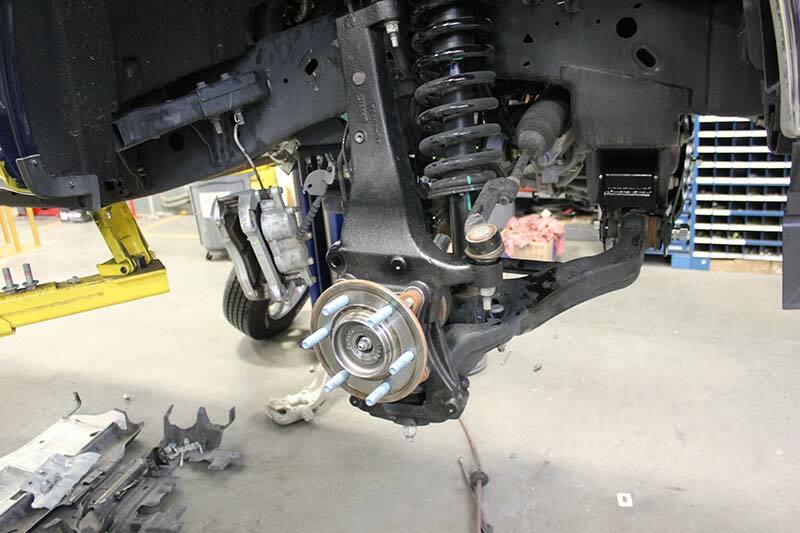 Once everything is fully reinstalled and tightened, we are ready to move on to the rear. Both rear shocks are first removed and then an emergency brake line drop bracket and brake line extension bracket are installed to again make up for the distance we are adding. Our rear axle is supported with a stand and the factory U-bolts are removed from both sides. The new lift block is installed underneath the leaf springs which gives us the lift in the rear. 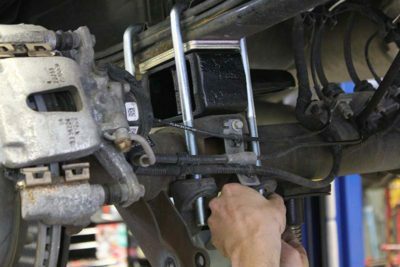 The new U-bolts are then installed in order to hold everything together. This process is repeated on the other side of the truck. The new Pro Comp ES9000 shocks are then installed on both sides. 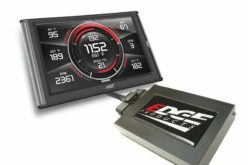 This will dramatically improve both our on-road and off-road ride quality. Finally, our rear driveshaft is removed from the differential and then reinstalled with a new aluminum spacer to make up for the added distance once again. 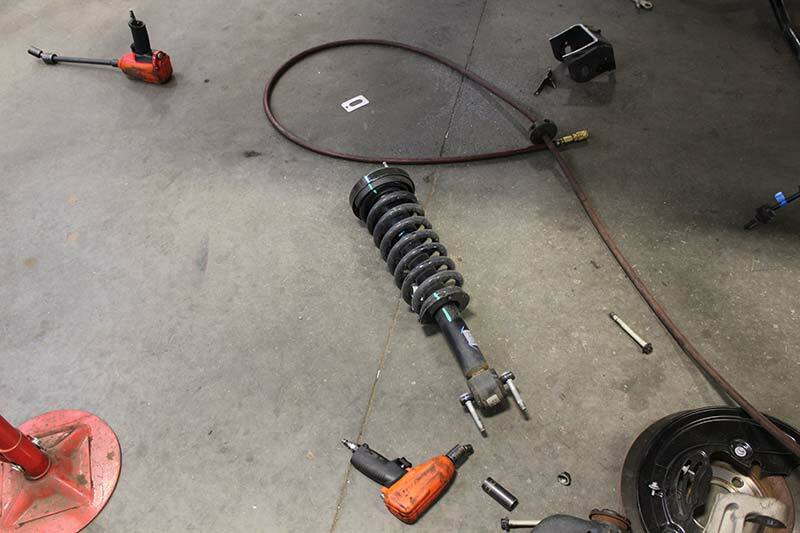 After that, all nuts and bolts are double checked, and once satisfied, we are ready to move on to our wheels and tires. 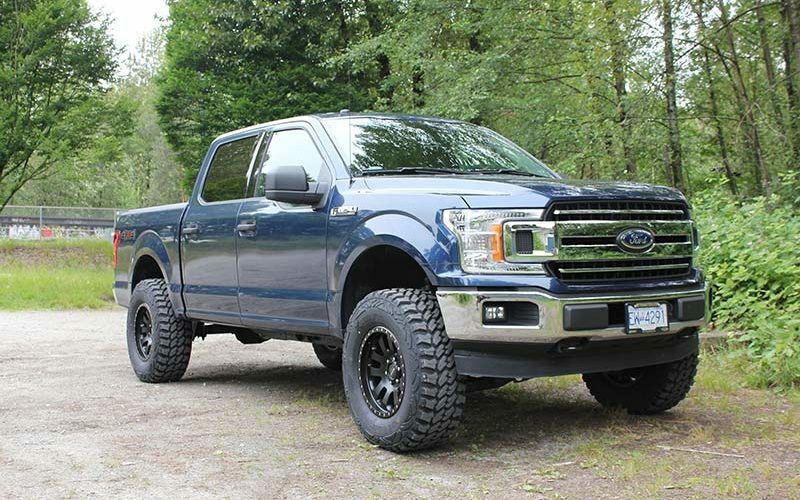 Our wheel and tire package includes a set of LT305/70R18 Pro Comp Xtreme MT2 tires with 18×9 Pro Comp Prodigy wheels that are finished in a great looking satin black. To start, our factory TPMS sensors are removed from our stock setup and installed onto our new wheels. 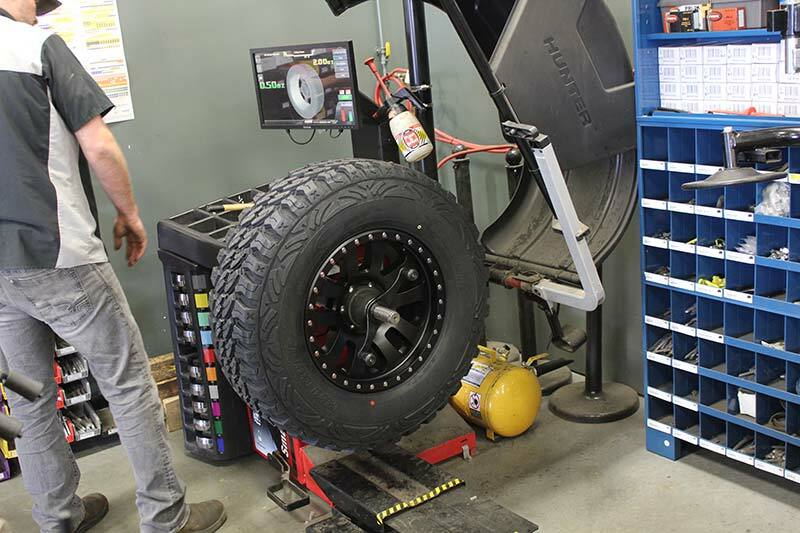 Once the TPMS sensors are installed on all four wheels, the tires are put on the wheels using the tire machine. 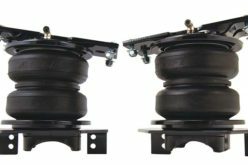 With the rubber securely on the wheels with full inflation, it’s over to the balancing machine. 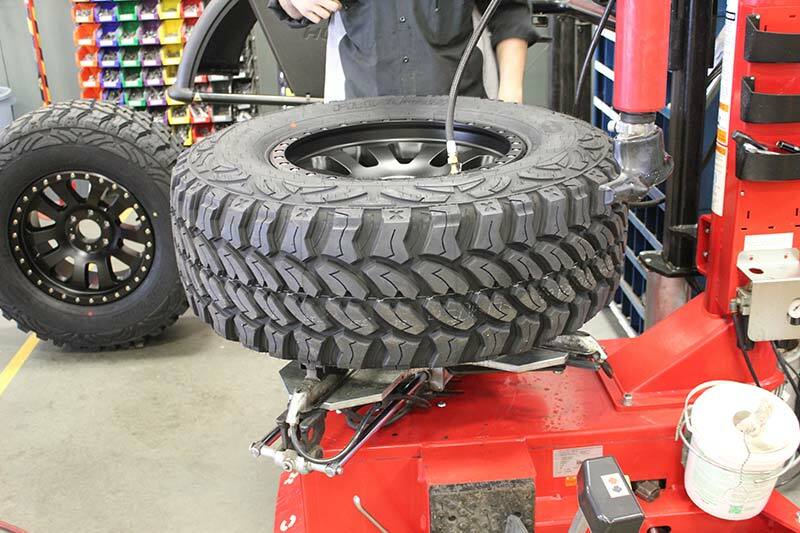 From there, it’s time to mount the tire and wheel package to the truck itself. The finished product. 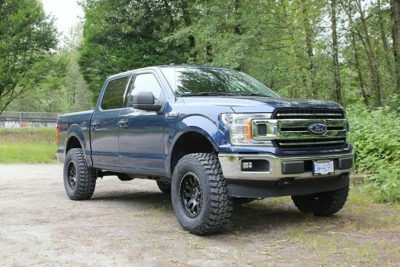 Big thanks again to Pro Comp for supplying the Lift Kit, tires and wheels, and to the guys at 4WheelParts for a seamless installation. Now obviously with a higher suspension plus a much larger wheel and tire package, our wheel alignment is going to be a little off. 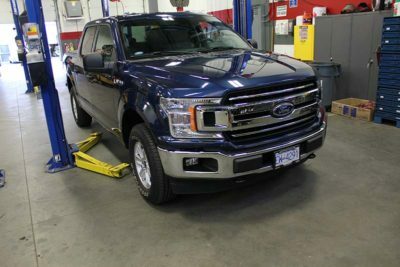 After a few adjustments on the alignment machine, the guys were able to ensure that the truck would drive straight and that the tires were contacting the road where they’re supposed to. After another quick check to ensure that there was no rubbing of the tires at a full turn, we were off and ready for our own test drive.